WASHINGTON — Embattled Ukrainian President Viktor Yanukovich called in sick while protests rage in the capital city of Kiev. Reuters reported that he took sick leave after a tough session in the Ukrainian parliament and did nothing to appease or calm the rising tension and protests throughout the country. 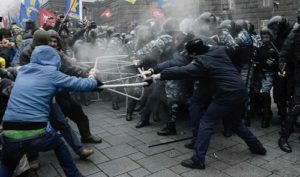 Yanukovich said that the anti-government protesters and their battles with police are a precursor of sorts to a potential civil war. He was reported to have a high fever and an acute respiratory ailment. Protesters have demanded that Yanukovich resign from his position at the head of the government, especially after he and his supporters in parliament hastily passed a heavy-handed anti-public protest law. They accused him of kowtowing to Russia, which had ruled Ukraine for decades during the Cold War. The country’s prime minister, Mykola Azarov, resigned after the protests escalated and people were hurt. The protest ban had reignited the protests, but also after a female reporter was brutally beaten for her reporting on the government and opposition movement. The crisis started when Yanukovich withdrew Ukraine from signing a trade pact with the European Union, after which the EU accused Russia of pressuring them to do so. Russia said that the EU should not meddle in Ukrainian affairs.